Welcome to Rocky Top Retreat in Pigeon Forge! 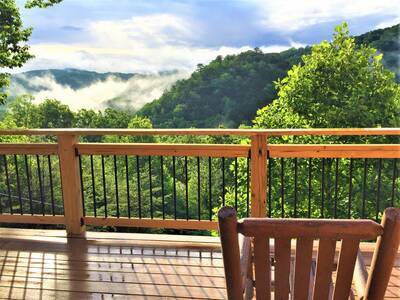 This 1 bedroom, 2 bath Smoky Mountain cabin rental offers some of the most stunning and amazing views of the Smokies, all from a super convenient location near downtown, Dollywood, The Island, The Old Mill, and countless other attractions in Pigeon Forge. Step inside this beautiful cabin and you’re immediately greeted by soothing natural wood accents and calming earth tones. The enormous windows seamlessly frame the expansive mountain views, including Mt. 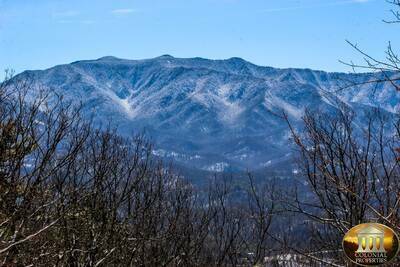 Leconte, one of the tallest peaks in the Great Smoky Mountains National Park. The super cozy living room provides you with a stone accented fireplace, flat screen TV, large picture windows to enjoy the views, comfortable seating, and convenient deck access. Just steps away from the living room, you will find the fully equipped kitchen featuring stainless appliances and all of the necessary items to help you prepare, cook, and serve your favorite home cooked meals from the comforts of your Pigeon Forge cabin rental. Located on the main level, you will find a romantic and delightful king suite bedroom with nearby full bath for added privacy. Venture up to the second level of Rocky Top Retreat and you’ll be blown away by even more mesmerizing views and a fun-filled game room. The game room provides you and your guest hours of enjoyment on the pool table or air hockey game. If that’s not enough, step outside onto the covered deck and soak your cares away in the bubbling hot tub overlooking the Smoky Mountains. The upper level of this vacation getaway also features an additional king bed and a luxurious bath with a wonderful jetted tub. Don’t forget to pack along your laptop or tablet when staying at this Pigeon Forge cabin rental so that you can enjoy the complimentary high speed WiFi internet. Additionally, in the warmer months, you’ll want to bring your bathing suit, pool toys, and sunscreen so that you can enjoy the nearby seasonal swimming pool. There’s also a covered picnic pavilion and children’s playground for you to use as well. For added convenience, this cabin offers both step and ramp entry, making getting into the cabin and unloading your luggage a breeze. 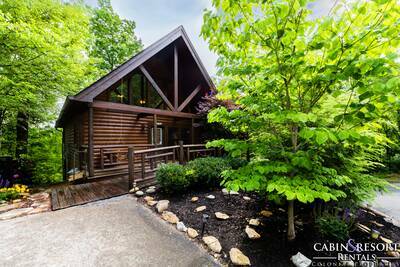 Rocky Top Retreat is a special cabin rental with countless amenities and features that are certain to make for an unforgettable visit to the Smokies. Plan your stay today! A: Hi Gina! 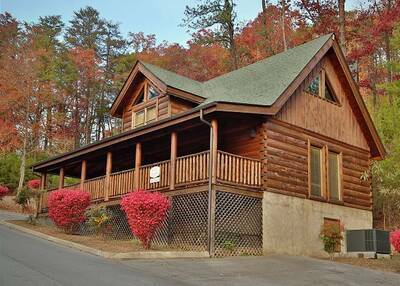 Rocky Top Retreat has a Master Bedroom with a King bed and a loft upstairs that also has a King bed. A: Hi Alex! Rocky Top Retreat has 1 Queen Sleeper Sofa. A: Hi Chantel! Rocky Top Retreat is not a pet friendly unit. We do have other properties on our program that are. A: Hi Tanya! 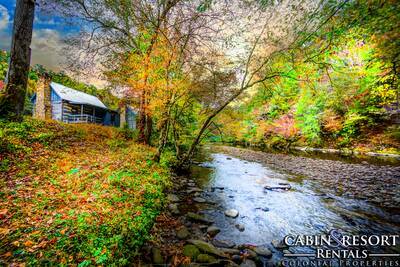 Rocky Top Retreat is located in the Pigeon Forge area inside Starr Crest Resort. “ Very nice cabin. We enjoyed our stay. The ladies at colonial properties were very helpful and extremely nice. I will be staying here again next year.